Wednesday, NPR reported that the CDC is strongly recommending that pregnant women get the new swine flu vaccine as soon as it becomes available, as they are one of the high-risk groups for the illness. Of the 45 initial deaths from H1N1 (between April 15 and June 16), 6 were pregnant women. Although that doesn’t sound like a lot, proportionally it’s huge. It’s 13 percent of swine flu deaths, whereas only 1 percent of the population overall is pregnant at any given time. They face a higher death risk and a higher hospitalization risk. In general pregnant women get sicker for longer. Experts know they’re climbing an uphill battle with preggos. Many are hesitant to take anything during pregnancy, and OBs don’t generally prescribe medications unless absolutely necessary. So should all pregnant women jump on this vaccine bandwagon, especially for a shot that is just starting to be tested? Earlier this week I wrote that the National Institutes of Health was looking for volunteers to test out the new swine flu vaccine. Guess what: plenty of people have leaped for the chance to be vaccinated. While we’re not sure what the side effects of this new vaccine will be, we already have legally immunized manufacturers from litigation, putting any adverse effects in with the federal vaccine court. The new H1N1 vaccine will come in a variety of formulations, including some that won’t contain thimerosal, according to a spokesperson for the Centers for Disease Control and Prevention. In three previous winters people receiving flu vaccines were 33 percent, 43 percent and 24 percent less likely to get the flu than people who did not get flu shots. This year [2007-2008], people who received flu shots were just as likely to get the flu as those who did not get flu shots. Pregnant Women. There’s the aforementioned complications for pregnant women, and there is the thought that they’ll pass on their immunity to their unborn. Families of Babies Under 6 Months. Because we don’t give tiny babies shots (usually), other members of the family should be vaccinated to protect them. All Kids 6 months to 24 years. So far, it seems that toddlers, adolescents, and teens are more susceptible to swine flu than seasonal flu. Plus, if they go to school outside the home, they are at risk in those germ-infested buildings. Adults age 25 through 64 who have underlying medical conditions. All Health Care Workers. Those in the health care field could spread the virus, but the bigger problem is that if they’re sick, they won’t be able to care for the rest of us. That adds up to an estimated 120 million Americans. Healthy adults are near the end of the list. And surprisingly, those over 65 are at the back of the line this time, because there is some evidence that they may have stronger immunity because of the last swine flu outbreak, whether vaccinated then or not. If you’ve read my posts before, you know that I’m a minimal vaccinator. So I’d like to know: Whether pregnant or not, how will you and your family respond to the CDC’s vaccine recommendations? Image: u-turn 77 on Flickr under a Creative Commons License. 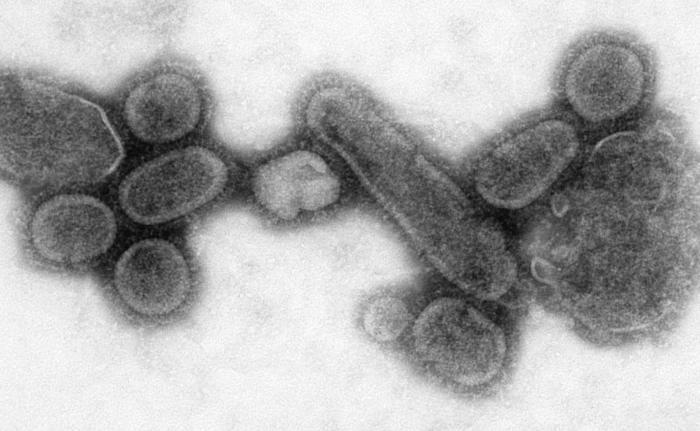 The swine flu virus: Wikimedia Commons. Vaccinations end up being more dangerous than the flu itself. Take care of yourself, exercise, eat right and you probably won’t even catch it. If you are in good shape, you will recovery faster if you do catch it, and as always, when you are sick with anything, be vigilant for secondary bacterial infections. These are what usually kill people. With intensive care being what it is today, and as widely available as it is, we are not going to have a repeat of the “Spanish flu.” Every “pandemic” has been less severe than the previous – go look it up – because our intensive care becomes better. Instead of squandering billions on worthless vaccinations from corrupt pharma companies, the government should be investing in hospitals and clinics. Please go read our new “Science Czar” John Holdren’s Ecoscience, and how he thinks its a good idea to secretly sterilize us through our water and vaccinations. I just found out I was pregnant last weekend. I thought of the flu vaccine with my last pregnancy (ended in miscarriage) because there was a flyer in my OB’s office recommending every pregnant woman be vaccinated no matter what stage of her pregnancy. I have NEVER received the vaccine. And honestly, I can’t remember the last time I had the flu, and IF I ever had the flu. Last time I even remember feeling flu symptoms, I was maybe 12, and I’m 25 now. The thought of having to get a vaccine that has been tested for such a short amount of time, that may not even work, and that has questionable ingredients in it scares the living daylights out of me. Add to it the vaccine makers are immune to any bad reactions and this ridiculous push by government…I don’t know what to do. My gut says no, but if I were to contract it and ended up in the hospital with complications or worse…I’m basically stuck between a rock and a hard place. I allowed my 7yo daughter to receive a regular flu vaccine this past fall… she is constantly ill, has Celiac, Asthma and numerous allergies. The winter prior, she was treated for pneumonia 3 times and multiple severe ear infections (we always wait a minimum of 3 days prior to medication). We decided that we’d give it a shot and hope that she had a healthier year… and surprise, she did. We had ZERO infections requiring antibiotics this past fall, winter & spring… in fact, I think she was the healthiest of all of us. Because of the numerous autoimmune diseases, Asthma and allergies in our household, we will opt for the swine flu vaccine in a thimerosal free form. I also an a Registered In Home Daycare and as such, our family is exposed to a huge variety of bacteria and virus on a daily basis… some of our parents work in very public situations and could bring a virus here without realizing they are sick. It’s definitely a personal decision… I’ve had the regular flu vaccine several times and never really noticed a difference (good or bad) for myself. I’m pregnant, due in February 2010, with my 5th child. I will fight with everything in me if necessary to avoid the swine flu shot for both me, and my children. I’d rather take my chances with the actual flu, than risk an untested, unproven vaccine. There are way too many unknowns, too few facts available, and too little time for testing for me to feel comfortable with the risk of this vaccine. Genes included in the new swine flu have been circulating undetected in pigs for at least a decade, according to researchers who have sequenced the genomes of more than 50 samples of the virus. The findings suggest that in the future, pig populations will need to be monitored more closely for emerging influenza viruses, reported a team led by Rebecca Garten of the federal Centers for Disease Control and Prevention in a report released by the journal Science. I agree that the shot is not tested and we have no idea what the long term consequences are. I am pregnant, due in Nov, and while I’ve never had a flu shot or given my 3 year old a flu shot, I am tossing the idea around for my family this year. This is largely due to keeping my newborn healthy over the winter because my 3 year old goes to preschool and brings home some fun germs that then get passed around our house. ( I wouldn’t vaccinate my newborn, of course, but maybe my husband, my 3 year old and possibly myself, after I have the baby ). My doctor has highly recommended the flu shot for me because I have an autoimmune disease and I’m pregnant but I’m praying (literally) to stay healthy because I’m really opposed to getting the shot while I’m pregnant. Like another reader said, I’m a bit between a rock and hard place. Still contemplating all the options. I should add that no one in my family will be getting a shot with thimerosal in it so we’ll definitely be looking into that as well. It sounds like you all have thought this through well. Although I minimally vaccinate (and haven’t at all for my 16mo), because my stepdaughter is in middle school, if a thimerosal-free version were available, I’m sure we would consider it (but honestly would probably not get it). That’s for the swine flu. As for the seasonal flu, I got the vax a couple of times when I worked at a hospital, and then got sick from it. So no seasonal flu vaccine, that’s for sure. A simple action like brushing teeth following each and every meal could make a big difference in our immune system,I believe. Our town has seen a fair share of swine going around, I swear I had it in February. I never get sick and I was out for two weeks with the same symptoms. I’m still here, and my kids are fine too. I will continue to opt out of all flu, including swine, vaccinations for my children. We combat illness with regular chiropractic adjustments, elimating additives and chemicals from our diet, eating healthy, and getting plenty of rest. I will not risk neorological problems. well i enjoyed reading all of these comments. i just found out i was pregnant and had my first doctors appt. yesterday. they asked me to take both vaccines and i was very hesitant…. my husband asked me to get the h1n1… well some of the ladies i work with are also pregnant so i asked around…. and im going to say no… this is my first child and im would rather risk getting h1n1 and knowing i hurt my own baby then even thinking about letting someone else do it….